Recommendations: ‘Ayre’ by composer Osvaldo Golijov … the best performances of this piece are live, and if you are lucky, then Nora Fischer will be the singer. I was blown away when I heard the piece and when I heard what Nora did with it. But if that doesn’t work … try the CD HUSH by Nora Fischer and Marnix van Dorrestein, two voices and electric guitar … old songs, but with respect for the original composition, nothing corny. If you enjoyed this interview with the the Matangi Quartet, they have an excellent website which offers plenty of background information, a new archive and current tour dates. I started to play the violin at the age of 5. In fact there were two reasons. Firstly, a girl in my class played the violin (now my sister in law). And the second and maybe most important … I didn’t have to take recorder classes. The viola came into my life just a few months prior to the start of the Matangi Quartet (1999). I think that listening to recordings is fine, is good, just to see what colours you could use for your painting. But after that you have to mix your own colours, pick your own brushes and create something that is you(rs). Being an artist is (about) an ongoing struggle I think. On a personal level, my technical skills are often a challenge. 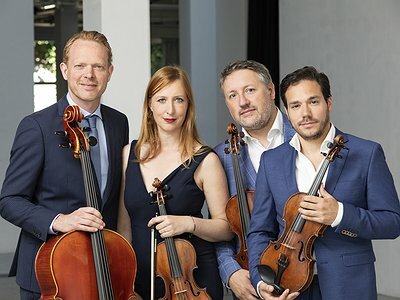 On the level of the quartet, there are a lot of things which you have to learn just by doing and going through certain stages of being a quartet. Your musicality has to fit in this 4 character ensemble. This means that you sometimes have to speak up and other times just have to listen. Rehearsal wise and talking wise. That’s not something you can learn at the conservatory, it has to do with willingness and determination for playing in a string quartet. Although my instrument is someone who's normally in a good mood, he (I think it’s a he, but with a feminine side … but then again, it might be a female with a male side) never really lets me down. It’s a very rare instrument as it is the only viola ever found by this particular Dutch maker Jan Heefke. He is not one of the famous Dutch makers of his time, but the instrument is outstanding. It matches our second violin (by the Dutch builder Rombouts) in an incredible way. The viola is a bit small but is quite high and has a warm but bright sound. This is one of my struggles …Having 3 children … with Maria-Paula, the first violin player of the quartet. Of course, Maria (as I call her) and I speak a lot about the quartet, but sometimes we have to try to shift our focus. We don’t have a fixed schedule, some concerts/projects need more rehearsal time than others. We used to sacrifice all our available time to the quartet. But with every member of the quartet having a family now, that no longer possible. When everyone feels the same excitement about the idea, the rest will follow easily. I think rehearsals are often about finding out how to make the painting, and concerts are about actually making the painting. Acoustics and ambiance will definitely influence our state of mind. And trust: trust in the people with whom you are performing, and trust in yourself … which is not always easy to evoke. Sometimes we use microphones or Ipads, but I think that’s about it. Amplification might sometimes give you a little bit of freedom (sound wise). Playing is the best! Talking can also help, but playing and learning from each other is the absolute best. Improvisation is not that easy with a quartet, especially because we were not educated to do that. We won’t be able to make an impro on command, but we can improvise in terms of our ways of playing. Creating soundscapes, you might call them. You have to be in the right mood to do so, if not, you could ruin a piece by it. It’s a delicate matter and easy to take the wrong turn or make the wrong decisions. How do you see the relationship between the 'sound' aspects of music and the 'composition' and 'performance' aspects? How do you work with sound and timbre? Some compositions are more inviting to experiment with sounds then others. Certain pieces will not reveal their secrets immediately, and for that reason it takes you some time to see what possibilities the piece will give to you. Fragrances can take you back 40 years in a split second, and so can music. Everyone know this song from his/her adolescence. If the radio plays that song, it can hit you the same way it did years ago. Magic …pure magic. The classical music scene is a conservative scene, so changing things takes time. But my feeling is that in the last 10 years, things are slowly shifting. Alternative concert forms are beginning to pop up more and more. Starting time and duration are not a solid truth anymore. Art forms are more and more combined and maybe most importantly, the artist who try these new forms are taken seriously more and more. Because of this, other ‘serious’ classical stars dare to walk on this path as well and so this relatively new genre is accepted step by step. "Art plays a key role in society. It must be a sign that regimes fear composers, painters, writers and other artists and try to make it impossible for them to work ."